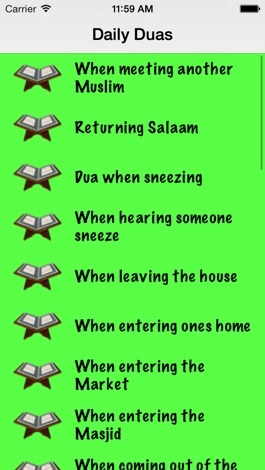 Daily Duas,an application that helps you in doing Zikr of Allah(SWT).Remembering Allah is one of the great virtues. 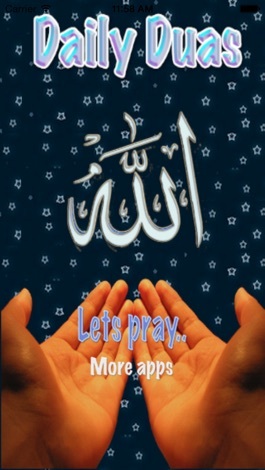 Prophet Mohammed (pbuh)said that "Dua is the very essence of worship".And also in Quran it is mentioned that-"And your Lord says: "Call on Me; I will answer your (Prayer)! "Surah 40 Verse 60. This app is a collection of all the Duas that we do in our day to day life,for ex: Dua before eating,Dua before sleeping,etc with Arabic text and English Translation. Lets do our best to practice Islam as it is supposed to be and lets make each deed of ours a worship by taking the name of Allah(SWT) before doing anything. Updates with more Duas will be rolled out in phases,Inshallah. Do make dua for us and for whole of the Mankind.